SEOUL (Reuters) - South Korea warned Wednesday March 18 that it would respond with decisive action if Pyongyang again blocked access to a joint factory park in North Korea, but said it was too early to consider shutting the project down. In the past week, the North has blocked movement across the heavily defended border to an industrial park run by South Korean companies in the city of Kaesong out of anger over joint military drills by South Korean and U.S. troops. "We are at this point not considering shutting down the Kaesong industrial zone," Unification Minister Hyun In-taek told a forum of journalists. "But if the North repeats the border traffic suspension after the end of the drills, the government will consider it a very grave situation and will take appropriate measures," Hyun said, without elaborating on possible steps. The four-day blockade, which was lifted Tuesday, stranded more than 400 South Korean managers in the Kaesong industrial park and nearly dried up supplies and materials for factories there, casting doubt on the prospects for a project that had been a lucrative source of income for the cash-strapped North. The project was born under a policy of engagement by a previous South Korean government that saw it as a way to ease tensions with the North and allow firms from the South to use cheap labor there to make goods like pots, watches and apparel. 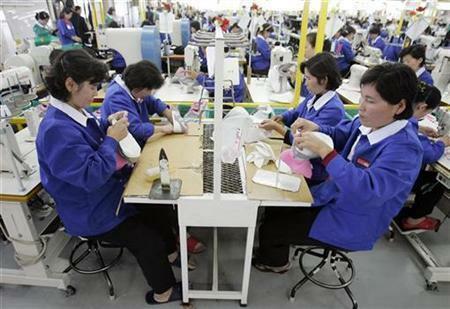 "If North Korea breaks the agreements with the South and causes enormous losses to the companies there, creating a situation where it is difficult to make investments in Kaesong a success, Kaesong will not be able to develop in a stable way," Hyun said. North Korea has directed increasingly acrimonious rhetoric against the conservative government in the wealthy South and its President Lee Myung-bak, who ended a decade of no-questions-asked aid to the North. The anger intensified last week when South Korea and the United States began annual military drills scheduled to end on Friday. Hyun said much more was at stake in the Kaesong project than the 700 billion won ($494.4 million) invested by the 101 companies operating there. "I believe the Kaesong situation has dashed the hopes that the North and the South would embrace each other despite the grave military and security conditions between the two," Hyun said. The blockade comes as North Korea has raised tension on the Korean peninsula by announcing plans to launch a satellite between April 4 and 8, which officials in Seoul and Washington believe is a long-range missile test in disguise. Hyun repeated the warning that going ahead with the launch would violate a Security Council resolution. North Korean Premier Kim Yong-il is visiting China, one of the communist state's last remaining allies. China has avoided even muted threats against the North's missile plans.